Polar bears playing on the ice, tigers hunting in the jungle, and nightingales singing in the heart of the woods -- animals are everywhere. 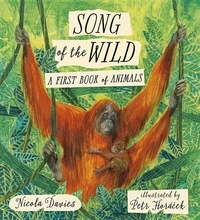 In a remarkable collection of poems, children's author Nicola Davies shares keen observations on wildlife around the world. Sometimes lyrical and sometimes humorous, the poems reveal fascinating facts about animals of every color, shape, size, and origin, from giant blue whales to bats as tiny as bumblebees. Lively, colorful illustrations by Petr Horácek reveal the vast beauty and variety of the animal world in this essential introduction, perfect for even the youngest amateur zoologists.